Autism Spectrum Disorder (ASD) is a complex, lifelong, developmental brain disorder. ASD can present with a wide variety of mild to severe combinations of symptoms and characteristics. The disorder often involves impairments in social interaction, communication, and language, and the engagement in restricted, repetitive, and stereotyped patterns of behaviours and activities. Individuals with ASD may experience communication difficulties, social and behavioural challenges, intellectual impairments, difficulties in motor coordination and attention, and physical health issues. Some individuals with autism may insist on sameness and resist change. These individuals may have difficulty interacting with others and may avoid human contact, give little to no eye contact, or prefer to be alone. They may have difficulty in expressing their needs. They may express heightened emotions at inappropriate times and throw tantrums. They may seem unresponsive to typical teaching methods. They can have over-sensitivity or under-sensitivity to pain or they may appear fearless and impulsive. They may show noticeable physical over-activity or under-activity and they may demonstrate uneven gross or fine motor schools. While some individual excel in specialized areas of abilities such as mathematics or art, most do not. 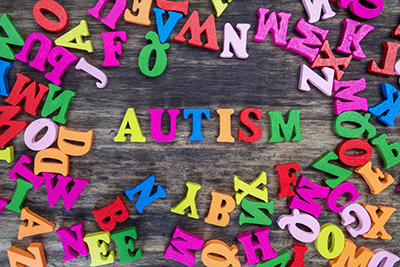 In the fourth edition of the Diagnostic and Statistical Manual of Mental Disorders (DSM) IV-TR, “Autism” was considered one of five disorders coming under the umbrella of Pervasive Developmental Disorders (PDD). The PDD category of mental disorders was characterized by a “severe and pervasive impairment in several areas of development,” including social interaction and communication skills. The five disorders under PDD were Autistic Disorder, Asperger’s Disorder, Rett’s Disorder, Childhood Disintegrative Disorder, and PDD Not Otherwise Specified. In 2013, DSM-5 was released and the diagnoses for the PDD category were collapsed into a single diagnosis, Autism Spectrum Disorder. Under this new criteria, individuals with ASD mush show symptoms of communication deficits and restricted or repetitive patterns of behaviours, interests, or activities from early childhood, even if the symptoms are not recognized until later in life. Social deficits would include difficulties in expressing social-emotional reciprocity (e.g., abnormal social approach, failure of normal back-and-forth conversations, reduced sharing of interests or emotions), using and interpreting nonverbal communication behaviours (e.g., inability to “read” others emotions, limited or no eye contact, abnormal body language, difficulties with gestures), and developing, maintaining, and understanding relationships (e.g., difficulty adjusting to different social environments, sharing imaginative play, or making friends). Restricted or repetitive patterns of behaviours can include stereotyped or repetitive motor movements, use of objects, or speech (e.g., lining up toys, flipping objects, echolalia), inflexibility to changes in routines (e.g., distress to small changes, difficulties with transitions, rigid thinking, rituals), restricted or fixated interests with abnormal intensity or focus (e.g., strong attachment to unusual objects, excessive interest in a specific topic), and over-sensitivity or under-sensitivity to sensory inputs (e.g., indifference to pain, adverse response to specific sounds or textures, excessive smelling or touching of objects). There has been a notable increase in the prevalence of ASD in Canada over the past ten years. Research studies suggest that 1-2% of the population has a diagnosis of ASD. Studies also show that ASD is 4-5 times more prevalent in males than females. ASD occurs across all racial, ethnic, and socio-economic groups. Studies have shown that among identical twins, if one of the twins has ASD then the other has a 36-95% likelihood of being affected by ASD. In non-identical twins, if one of the twins has ASD then the other is affected by ASD from 0-31% of the time. Amongst non-twinned siblings, if one sibling has ASD the second sibling has a 2-18% chance of being affected by ASD. ASD tends to occur more often in individuals who have certain genetic or chromosomal conditions (e.g., Down syndrome, fragile X syndrome, tuberous sclerosis), with approximately 10% of individuals with ASD having some other genetic or chromosomal condition. ASD commonly occurs with other developmental, psychiatric, neurologic, chromosomal, and genetic diagnoses. There is an 83% change of a co-occurrence of one or more non-ASD developmental diagnoses. There is a 10% chance of a co-occurrence of one or more psychiatric diagnoses. There is a higher risk for ASD in children born to older parents and for children who are born prematurely or with lower birth weight. Research has shown that early diagnosis and intervention provides the most beneficial outcomes for individuals with ASD. When performing an assessment for ASD, a team of professionals (e.g., psychologist, occupational therapist, physical therapist, speech and language pathologist, and medical doctor) will be involved in determining the individual’s risk and likelihood of being affected by ASD. Each of these professionals contributes relevant information regarding the individual’s health, social functioning, and behaviours, with the psychologist integrating collected information to make a formal diagnosis. A psychologist conducting an ASD assessment will review reports from other professionals, complete a history interview, and collect data from testing and questionnaires (e.g., intellectual ability, behaviours, emotions, adaptive skills, autism symptoms). Once the data has been reviewed, the psychologist prepares a report outline his or her findings, diagnoses and recommendations.